accompanied by velvety tannins. Pair the wine with red and white meats, game meats prepared in various ways. Pastas, terrines, and pâtés. Creamy, dry, and aged cow and goat milk cheeses. 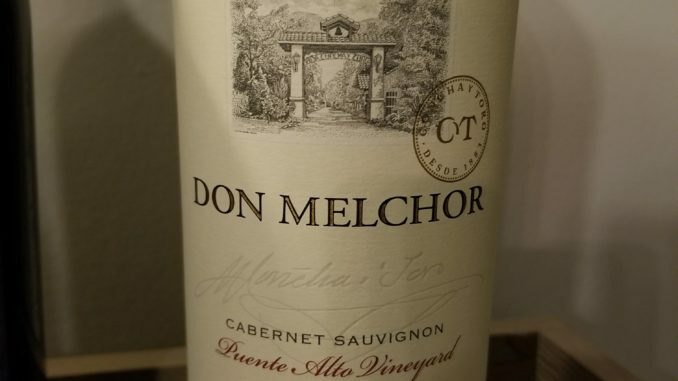 My Review: So this is the third time that I’ve had the Don Melchor Cabernet Sauvignon (having previously had the 2011 and 2013 vintages), and to go ahead and get it out of the way, I have to say that this was probably my favorite vintage so far. Yeah…I said it. In the glass the wine was nice and dark, and on the nose I picked up dark fruit that carried through to the palate and was joined by mineral flavors that stopped the wine from being too “fruity” and gave it a nice dry finish that left me wanting more without completely drying out my mouth. Since this was part of my “night of pricey wines” I only paired the wine with cheese (burrata for the record) and meatballs, but having previously tried vintages of this wine with steak and pastas, I can say with some certainty that the 2014 Don Melchor Cabernet Sauvignon would go great with a perfectly cooked ribeye (medium rare, thank you very much). As with previous years, I struggle with whether the wine is worth $125 (though to be fair, a little searching online showed that it can be had for less), and while I’m not quite sure I’m there yet (more of a mental block than anything to be honest), it’s definitely the closest I’ve come to saying that it’s worth that price point.